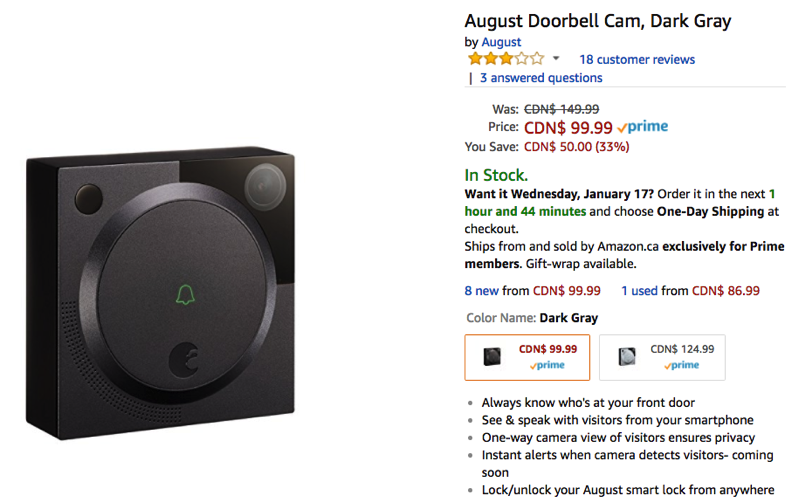 Amazon.ca has the August Doorbell Cam on sale for 33% off at $99.99, saving you $50. This marks the lowest price ever for this unit, according to price tracker CamelCamelCamel. This HD doorbell cam lets you see and speak to visitors at your front door, while you can also view what’s happening with a one-way view at any time. You will also get push notifications when motion is detected (automatic recording), and it can unlock or lock your August Smart lock as well, since it acts as a bridge. Click here to jump on this sale while it’s still available on Amazon.ca (also available on BestBuy.ca).